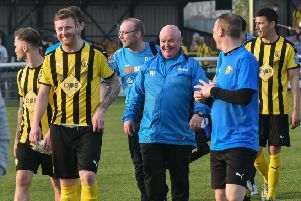 Leamington manager Paul Holleran is not writing off Slough’s title chances despite them having slipped off the pace in the Southern Premier Division. The Rebels, who topped the table in October, have lost all three league fixtures in 2017 to drop to sixth and go into tomorrow’s game at the Phillips 66 Community Stadium nine points behind the league leaders. However, despite their poor run of form, Holleran says he expects them to be in the shake-up for honours come April. “I’m really looking forward to the game,” said Holleran who saw his side lose 2-0 in the reverse fixture in September. “They’ve had a tough couple of weeks. “But all teams have periods of difficulty and it’s how you manage these periods. “They’ll still be more than happy with where they are. They are right in the mix. “We went there and they were by far the better side. They’ve gone back to Slough, their crowds are on the up and they are very capable of finishing the season strongly. Saturday’s postponement at Cinderford due to a frozen pitch has forced another unwanted Tuesday night game into Brakes’ schedule, with the match having been rearranged for February 7. However, Holleran says his squad are now better equipped than ever to cope with the demands of games on Tuesday, Saturday, Tuesday. “We’ve got good cover and players pushing other players. “We’ve got options to change things in the 11 and in the 16 and we wouldn’t be weakened. “The last few games we been without Pondy and Hoody but you’ve only got to see how well Joe Magunda has played. We’ve needed that. “Hoody, Pondy, Jack Edwards, Callum Gittings, they all missed games recently but we’ve come through with a good return of points. Jamie Hood took part in a full training session last week and is not too far away from a return. Brakes are in Birmingham Senior Challenge Cup action on Tuesday night when they entertain Stratford Town.